I have now been writing this blog for just over five years, and it seems timely to step back and look at how the climate change problem appears now compared with five years ago. In some ways it is easy to feel discouraged. In the last five years the world has managed to get through about a tenth of its remaining carbon budget, a budget that needs to last effectively forever. However, in many ways there seem to be reasons for much greater optimism now than five years ago. Several trends are converging that together make it appear that the worst of the risks of climate change can be avoided. Legislation is now in place in 164 countries, including the world’s 50 largest emitters. There are over 1200 climate change and related laws now in place compared with 60 twenty years ago[i]. And this is not restricted to developed countries – many lower income countries are taking action. Action at national level is being supported around the world by action in numerous cities, regions and companies. This trend has now been reinforced by the Paris Agreement, which entered into force in November 2016, and commits the world to limiting temperature rises and reducing emissions. Many developed countries, especially in Europe, have shown since 1990 that it is possible to reduce emissions while continuing to grow their economies. Globally, emissions of carbon dioxide from energy and industry have at least been growing more slowly over the past four years and may even have reached a plateau[ii]. Among the many policies put in place, the growth of carbon pricing has been especially remarkable. It has grown from a few small northern European economies 15 years ago to over 40 jurisdictions[iii]. Prices are often too low to be fully effective. However, carbon pricing has also been shown to work spectacularly well in the right circumstances, as it has in the UK power sector. And the presence of emissions caps in many jurisdictions gives a strong strategic signal to investors. Companies are under increasing pressure to say how their businesses will be affected by climate change and to do something about reducing emissions. And initiatives such as the Climate Action 100+, which includes over two hundred global investors controlling over $20 trillion of assets, are putting pressure on companies to step up their action. This will further the trend towards increasing investment in a low carbon economy. Meanwhile, many funds are divesting from fossil fuels, and vast amounts of capital are already going into low carbon investments. 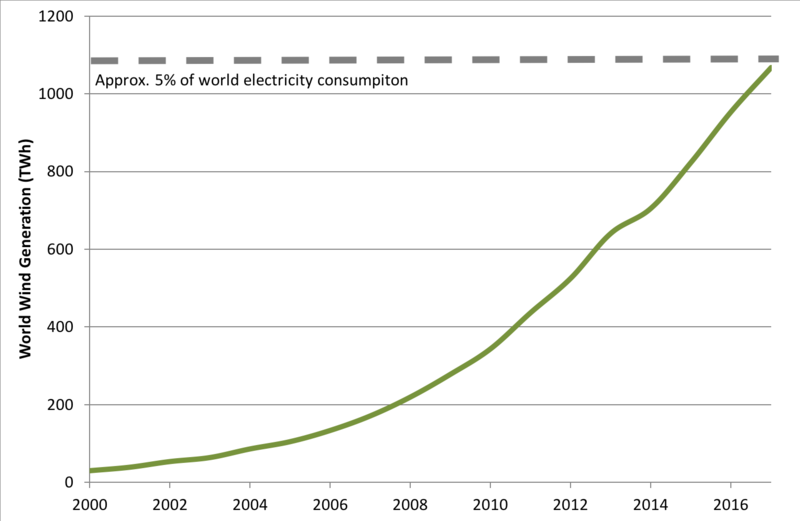 Solar and wind power and now at scale and continuing to grow very rapidly. They are increasingly cost-competitive with fossil fuels. The decarbonisation of the power sector thus looks likely to proceed rapidly, which will in turn enable electrification to decarbonise other sectors. Electric vehicle sales are now growing rapidly, and expected to account for the majority of light vehicle sales within a couple of decades. Other technologies, such as LED lighting are also progressing quickly. This is not only making emissions reductions look achievable, it is making it clear that low carbon technologies can become cheaper than the high carbon technologies they replace, and can build whole new industries as they do. 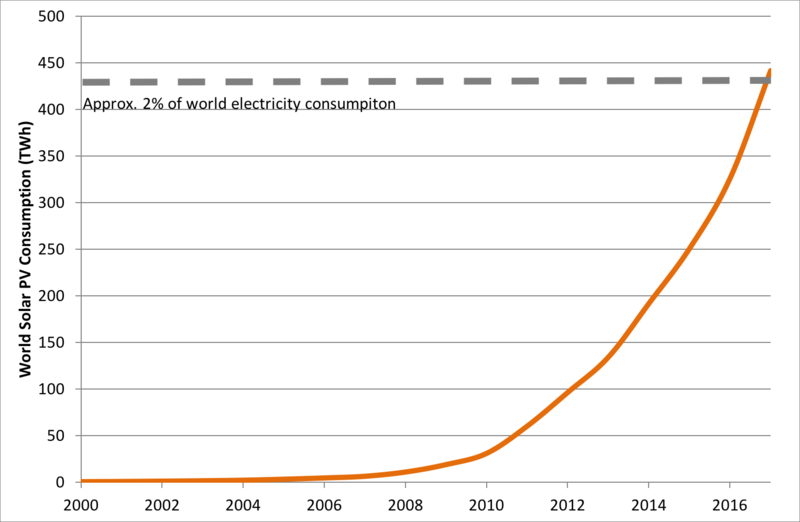 As a reminder of just how fast things have moved, in the last five years alone, the charts here show global generation from wind and solar since 2000. Falling costs of low carbon technologies, more than anything else, gives cause for optimism about reducing emissions. As lower carbon alternatives become cheaper the case for high carbon technologies will simply disappear. The climate has already warmed by about a degree Celsius, and some impacts from climate change have been greater than expected. However, the increase in temperature in response to increasing concentrations of greenhouse gases has so far shown few signs of being towards the top end of the possible range, although we can never rule out the risk of bad surprises. There will still be serious damage from climate change – indeed some is already happening. And it is by no means clear that the world will act as quickly as it could or should. And there could still be some nasty surprises in the earth’s reaction to continuing emissions. Consequently, much effort and not a little luck is still needed to avoid the worst effects of climate change. But compared with how things were looking five years ago there seem many reasons to believe that things are beginning to move in the right direction. The job now is to keep things moving that way, and to speed up progress. This entry was posted in 2050 targets, Adaptation, carbon budget, carbon pricing, carbon taxes, climate change, Climate change policy, electric vehicles, emissions targets, emissions trading, greenhouse gas emissions, long term targets, Paris Agreement, renewables and tagged climate change, climate change policy, decarbonisation on 10/04/2018 by adamwhitmore. There are many worthwhile uses for revenues for carbon pricing. In practice a mixture of uses is likely to be found. My previous post estimated that carbon pricing will raise around $22 billion worldwide this year, and suggested that this has the potential to grow by an order of magnitude. This post looks at how revenues might be used. Revenues from carbon pricing can be used for both climate change related purposes and more general purposes. The main categories are summarised in the table, and described briefly below. The introduction of carbon pricing is often accompanied by concerns about the effects on energy prices on lower income households. Rises in electricity prices to households due to pricing of power sector emissions are of concern even under schemes such as the EUETS which do not directly cover households. Some proportion of revenue can be set aside to compensate vulnerable households. This was a feature of the now repealed Australian scheme. Other taxes can be reduced by an amount equal to the revenue raised from carbon pricing. If this is done in full the carbon pricing scheme is usually referred to as revenue neutral. This is a feature of the British Columbia carbon tax. Governments can retain some or all of the revenue for general expenditure or deficit reduction. This is, for example, the case in the UK, where the Treasury has a long history of viewing taxation and expenditure as a whole, and there is resistance to earmarking (“hypothecation”) of funds. An equal payment can be made to all citizens in a jurisdiction (see previous post). The Swiss carbon tax currently returns a portion of revenue equally to all citizens. Such an approach has been proposed as part of bills at federal and state level in the USA. Measures to adapt to climate change can be funded either within the jurisdiction that raised the revenue or internationally. For example, in its July proposals for the next phase of the EUETS, the European Commission included provisions for Member States to use some of the revenues from the EUETS to finance actions to help other countries adapt to the impacts of climate change. Funds could be channelled through international institutions to provide funds to match national expenditure, potentially making a substantial contribution to meeting any funding shortfalls. Funds could be provided to those adversely affected by climate change. There is a continuing debate on this issue and how it relates the “loss and damage” agenda within the UNFCCC process, including the large overlap with the issue of adaptation. However there has been little practical progress on this to date. Funds may be provided for measures such as retrofitting homes and businesses for greater energy efficiency, and the installation of renewable energy technologies. Revenues may also be used to fund research, development and deployment of new low carbon technologies. A number of schemes in North America include provisions of this type, including California, RGGI and Alberta. The EUETS has also included support for new technology from the sale of 300 million allowances from the new entrant reserve (the “NER 300”). However funds raised from this were less than originally expected due to lower allowance prices, and the allocation process has been delayed. The EU is now planning an Innovation Fund in the 2020s, again to be funded by the sale of allowances. So which should be preferred? Many uses of funds have merit, and the choice will depend on local political and economic circumstances. However some seem to have particular arguments in their favour, with a mixture of often likely to be preferred. Supporting adaptation and potentially also providing recompense to those adversely affected by climate change has a strong appeal on grounds of justice, and may form a valuable element of some programmes. Returning funds equally to citizens has advantages covered in my previous post. This could be accompanied by providing additional support to some vulnerable groups. Finally, using revenue to fund additional emissions reductions, especially with a component of assistance for the disadvantaged, has proved understandably attractive in a number of jurisdictions in North America and to some extent in the EU. Deeper emissions cuts will require new technologies and large-scale investment. This in turn requires progress to be made now, increasing in scope and extent over time. Increased use of funds from carbon pricing to support such efforts seems likely to prove worthwhile. This entry was posted in Adaptation, carbon pricing, carbon taxes, Climate change policy, emissions trading, Revenue and tagged adpatation, carbon pricing, carbon taxes, climate change, climate change policy, decarbonisation, emissions trading, emissions trading scheme, energy efficiency, revenue on 10/11/2015 by adamwhitmore.